I picked up The Soldier’s Wife a few weeks ago after the cover drew me in and the story had me adding to my pile. Having loved The Guernsey Literary and Potato Peel Pie Society, I had high hopes for this novel and wasn’t disappointed. The writing itself was stunning as was the depiction of Guernsey and the story stole a bit of my heart. 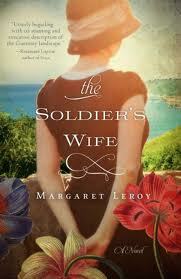 The Soldier’s Wife will definitely sit on my shelf to be reread. What stood out most for me was how astounded and left in awe I grew at how Margaret Leroy strung the words of this novel together so poetically and lyrically. This captured my attention even more than the story itself! I reread passages, studied the words and wondered at them the entire way through this novel. It has been a long time since I have read something so stunning and beautiful. I didn’t become as absorbed by the love story as I would have thought which surprised and saddened me. If I had, this story would have blown me away. Because of their distant and seemingly forced relationship, I grew fascinated instead with the small details about the island and life during occupation. Vivienne’s character drew me in and I loved watching her discover what kind of woman she is and how far she will go to protect and provide for her daughters as well as the compassion and kindness she has for others. Her character felt intensely real to me and I was loath to have her story end. Vivienne’s two daughters provided an interesting perspective on the occupation. First, I loved the younger daughter who was so spunky and stubborn and boisterous and left me on the edge of my seat wondering what trouble she might fall into. Then there was the young teenage daughter’s story, which I was left wanting more of. Teetering on the verge of adulthood during such a precipitous time when all the men had left and only German soldiers remained, Leroy touched on the issues with her character, but I would have loved more. I loved the depiction of Guernsey and particularly loved the intricate details about the struggles during occupation from the lack of material for dresses to the food shortages and how they survived by stretching out portions, having to turn into their lands into vegetable gardens and needing to find new foods to enjoy. I will definitely seek out Margaret Leroy novels in the future, and look at some of her previous works.